How stocks have reacted this quarter has really been no surprise. Back on January 22nd, the White House announced tariffs on solar panels and washing machines and the effect on stocks was dramatic (date indicated in green on the chart below). Since that time the President’s lead economic advisor has resigned and been replaced; and a whole array of further tariffs have been announced. In response, China, Canada, and Europe have all announced tariffs on US goods and the rhetoric shows no signs of dissipating. Fortunately, this has had no impact on actual corporate earnings thus far. Those earnings continue to be very strong and remain a key support for the stock market. The Federal Reserve raising interest rates, a large concern last year, has clearly taken a back seat now to trade. Long term rates are not rising nearly as quickly as short term rates, indicating that the bond market does not foresee the economy continuing to grow at its current rate. This market behavior suggests that the Fed will eventually slow down or stop the rate increases – e.g. that the economic growth outlook itself is not enough to force longer-term rate increases. 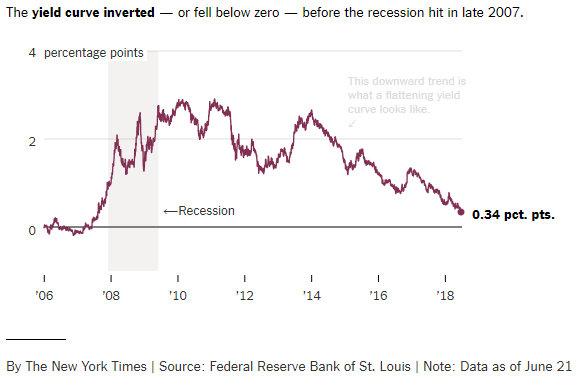 This presents some cause for concern as a flat to inverted yield curve (when short term rates equal or exceed longer term rates) almost always portends a recession: an inverted yield curve has preceded every recession since 1960. In all that time, there’s been only one false alarm, in the mid-1960s. While an inverted yield curve has not yet occurred, rates are heading this direction (note the waning delta between the 2yr and 10yr treasury rates in the following chart) and do warrant some vigilance. Investors are wise to pay close attention now however, given that stocks will typically decline around 6 months BEFORE a recession actually occurs and recessions are only labeled as such AFTER they start. For the present however, the US economy continues to hum along as unemployment is at record lows, wages increases thus far have been modest, and inflation is still in check. Housing price trends, rising fuel prices, and rising healthcare costs are all potentially inflationary. Some economists fear these hints of inflation will lead the Fed to raise rates too much, leading to a ‘policy mistake’ and causing a recession. As of now, these concerns appear overblown. In the near term, tariffs and trade issues will continue to dog stocks and even the mere hint of an impact to corporate earnings could topple the stock apple cart. We continue to monitor the economy and the market sentiment closely and remain poised to take protective action if necessary. Protection for your overall portfolio from down-trending markets When the market is going up, you benefit as aggressively as you wish. When the market is going down, your assets are protected, or even profiting. Over time, you will see returns that exceed the market if only by AVOIDING market corrections and bear markets. By using one of our more aggressive long strategies in an uptrend, you will see even better performance. MarketTrend Advisors, Ltd. is an independent registered in the States of California, Florida, New York and Texas. Other Securities Industry Affiliations or Activities. MarketTrend Advisors, is not registered as a broker or dealer, nor do we have any partners or employees who are affiliated with any broker or dealer. See Form ADV, Part II for official declarations. MTA portfolio strategies assume risk and no assurance is made that investors will avoid losses. No representation is made that clients will or are likely to achieve profits or incur losses comparable to those shown. Performance results are shown for illustration and discussion purposes only. The performance information has not been audited. However, the information presented is believed to be accurate and fairly presented. All performance figures in this presentation are net of management fees and commissions. Management fees are charged to actual client accounts on a monthly basis. Accounts include both taxable and non-taxable IRA accounts. Regarding the MTA Blend strategy: This strategy was migrated into the MTA Wealth Builder strategy and closed in December 2008. Regarding actual performance: Actual performance for all strategies includes all commissions as well as management fees (fees range from 1% to 2%). Actual performance statistics are based on the inception date of each strategy through the end of the last business day of the most recent month listed in the monthly performance section of this report. Starting with Q4, 2006, returns include only assets of Fidelity clients who were fully invested in their respective strategies. Returns before Q4, 2006 include all Fidelity client assets regardless of investment status. Results do not include the assets of clients at other brokerage firms. Regarding future performance: Past performance may not be indicative of future results. Therefore, you should not assume that the future performance of any specific investment or investment strategy will be profitable or equal to corresponding past performance levels. MarketTrend Advisors is not liable for the usefulness, timeliness, accuracy, or suitability of any information contained in its web site or of any of its services. The user understands that the information given can and will fail to predict the direction and magnitude of market price movements and the user can lose money when using this information.